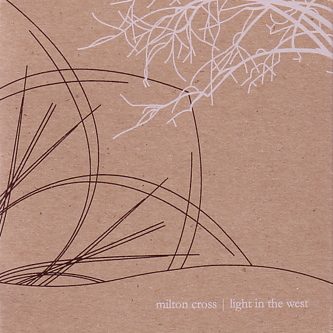 Milton Cross is already an established member of America's avant-garde glitterati, performing as part of Tarentel, but this striking album will undoubtedly cement his reputation as a formidable creative force in his own right. Light In The West exhibits a tremendous depth and a restlessness when it comes to shifting between genres and approaching to composition. Eleven-and-a-half minute opener 'It's Been Almost A Year', while by no means indicative of the record's overall tone, makes for a majestic introduction: knitting together strands of hacksaw violin and harmonium drones, the piece begins with a elegance and lyricism reminiscent of Nils Okland's Hardanger fiddle - or perhaps even in its minimalist repetitions the music of Arthur Russell. Soon, the these gentle, articulate strokes dissolve into a more complicated weave of drone textures and electronics, via 'Mountain Pulses' and its Biosphere-like filtered ambience. The tone brightens up again for 'Mull It Over From The Midwest' which brings together strummed acoustic guitar and fuzzy electric screeches, sounding a little like an all-analog Fennesz might. Just as compelling, though entirely different in execution, 'Leaves Do Not Have Meaning' is a deeply textured field recording exercise, and Cross is clearly a skilled sound sculptor as well as a talented instrumentalist, drawing together these various disciplines on electroacoustic outings like 'Slow Footsteps Kept Me Whole' or the blissful drone coda of 'Future Ghost'. Beautiful, complex and brilliantly executed, Light In The West is a real treat: it's a technically accomplished venture into edgy, experimental territory that never comes across as stuffy or alienating. A rare thing indeed.